Italy says, on your bike! The Italians love their cars and bikes, but they are also love sharing. That might explain why car and bicycle sharing is so popular – you get to drive a good quality car for a tiny fraction of the price of buying one. It’s good for the cities and their residents too. Over 700,000 Italians use car sharing schemes, and the country has the most impressive record of bicycle sharing in Europe, with 200 municipalities sharing over 13,500 bikes between them. Not only can residents breathe easier, the beautiful historic architecture can also remain as clean as the day it was built. Cars are ecologically and financially expensive, and Italian cities just weren’t built for them thousands of years ago. As roads and car parks have become more and more congested, people turn to buses, trams, undergrounds and walking. There are times, however, when only a car will do. While some countries just let cars take over, the Italians approached the problem rather differently. The Ministry of the Environment funded the creation of a national consortium called Iniziativa Car Sharing (ICS) to enable cities to start car sharing schemes. City governments allow these schemes to use car parks and dedicated parking areas for free. They also encourage the use of electric cars by allowing them to drive in areas where petrol vehicles can’t go. Milan has 370,000 shared car users; that’s nearly a quarter of the total population, let alone of the car drivers. According to a nationwide report by the Sharing Mobility National Observatory there are now 5,764 cars available for car sharing across Italy. Some are described as “free floating”, which means the car can be picked up in one location and left somewhere else in the city. Others are station based, which are picked up and left in designated areas. The 12 most populated cities in Italy all have some form of car sharing service. Milan has 370,000 shared car users; that’s nearly a quarter of the total population, let alone of the car drivers. Rome has 220,000, with the scheme also popular in Turin and Florence. Milan has invested a lot of money on public transport, pedestrian and cycle routes to deter the use of a cars in the city centre. Now, almost 30 percent of the Milanese don’t own a car, which is good for the environment and helps decrease traffic. When you consider that 80 percent of city cars travel for less than an hour a day, carrying an average of 1.2 people, sharing the rest of the time with others not only decreases the number of cars in circulation but also frees up parking spaces. It can vary slightly from company to company, but generally you pay a registration fee and are issued with a card or a phone App that allows you to unlock the car that you have pre-booked. You can also see a map on the App showing where the nearest available cars are located, making it easy to book a car parked nearby. The ignition key will already be inside and you type in a code to start the engine. You will then be charged per minute of your journey, with fuel, Insurance and parking included. Share’Ngo charges €10 membership and €0.28 per minute. Women can drive free of charge between 1 and 6am. 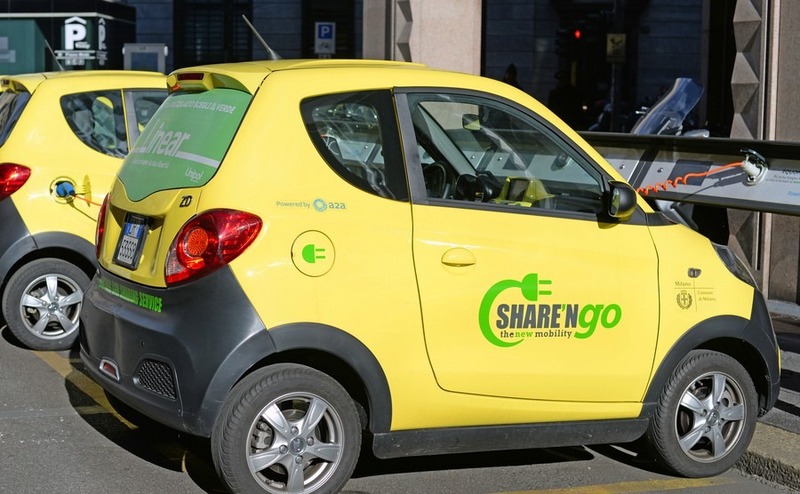 As an example, Share’NGo is a company that operates in Rome, Milan and Florence with a growing fleet of electric cars. It charges €10 membership and its base charge is €0.28 per minute, with big discounts when you buy packages of minutes. Women can drive free of charge between 1 and 6am. Car share schemes generally also have 24 hour phone lines for booking and assistance. Bike sharing is best suited to the large flat cities of Northern Italy where 81 percent of Italy’s shared bikes can be found. So far, Milan and Rome between them account for 60 percent of bike sharing, but smaller towns in the South and more rural areas are now encouraging people to leave their cars at home. Cycle lanes are popping up everywhere and historic centres are banning cars. Road cycling is also a very popular sport across the country and many regions have cycle routes and bike hire for tourists. One of the main bike sharing companies in Italy is Bicincitta, which has 6,241 bicycles covering 115 municipalities. Through the use of an electronic pass, each user can take a bicycle from any bike-parking stand present in the city and return it wherever they find an open parking space. So, if you are considering living in one of Italy’s beautiful cities, don’t worry about rushing out and buying a car. Save some money and help the environment by sharing.